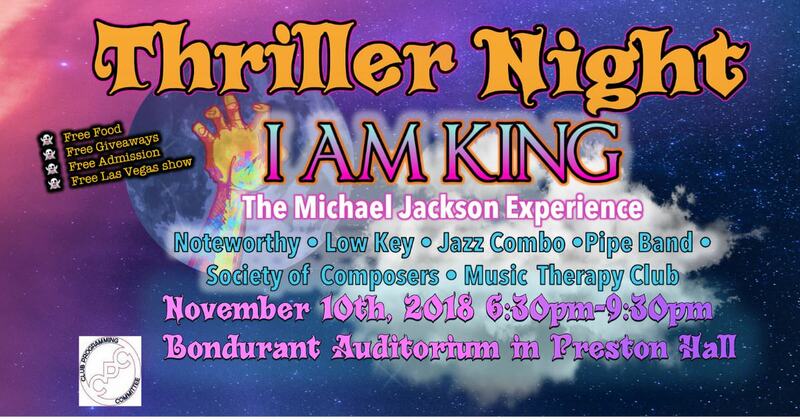 The Radford University Music Business Student Association presents Thriller Night featuring I Am King, The Michael Jackson Experience on Saturday, November 10, 2018 at the Bondurant Auditorium located within Preston Hall on the campus of Radford University. Enjoy a night of Michael Jackson music as multiple Radford University clubs collaborate to create this special fall and Halloween themed concert themed "Thriller Night". Music performances will feature both university bands and the main act from Las Vegas, I Am King, The Michael Jackson Experience. There will also be free food and giveaways. I Am King takes the audience on a musical and visual journey into the world of the King of Pop. Michael Firestone’s live vocals, supported by an incredible cast of the world’s most talented musicians, singers and dancers brings Jackson to life in an explosion of unmatched energetic perfection. I AM KING features amazing renditions of Jackson’s biggest hits including “Bad”,”Billie Jean”, “Thriller”, “Man in the Mirror”, “Human Nature” and many more. Michael Firestone is the creator of the Las Vegas show “MJ Live”. He has been hailed by fans and critics alike as the heir apparent to Michael Jackson in look, performance and authenticity. When it comes to Michael Jackson impersonators, there are none quite like Michael Firestone. His ability to sing live while mastering the intense dancing that Michael Jackson was so famous for has made him the most sought after MJ tribute artist in the world. I Am King - The Michael Jackson Experience is as close as you will get to seeing the King of Pop live in concert! The mission of this event is to help promote music through the New River Valley community. Multiple Radford University clubs are collaborating in this fall/ Halloween themed concert. This entire festival is organized, marketed, designed and executed by the students of the Music Business Department. Students receive no class credit, only an invaluable learning experience while creating an amazing event on campus. Additional organizations co-hosting this event include the Music Business Student Association, Grammy U, Mu Phi Epsilon, Low Key, American Choral Directors Association, Society of Composers Inc at Radford University, Sigma Alpha Iota, Phi Mu Alpha and Noteworthy. To view the event flyer, visit: https://i.imgur.com/rmznilg.jpg. For more information, visit: https://www.facebook.com/RUBonnieRoo/ or https://www.facebook.com/events/251896525528669.